This exhibition has now finished and is visiting the Museum of Tropical Queensland in Townsville. Our current dinosaur exhibition is Lost Creatures , located on Level 2 (free admission). Test your strength against a T-Rex jaw, uncover fossils and bones at a dig site and learn about how dinosaurs lived – from how fast they ran to how they digested their food. This is one exhibition you’ll be roaring to sink your teeth into! This exhibition features animatronic versions of some of the world’s most famous dinosaurs, including Muttaburrasaurus, one of the most complete dinosaur skeleton specimens ever found in Australia, and of course the carnivorous Tyrannosaurus rex, King of the Cretaceous Period. Uncover fossils and bones, compare the types of plants that dinosaurs ate, examine insects under microscopes, recreate the sounds of various dinosaurs and find out how they digested their food. Look through the eyes of different dinosaurs to learn how carnivores and herbivores saw the world differently. This exciting exhibition is recommended for children 3 - 8 years old. Tickets are on sale now from the Museum ticket office on Level 2 or online at the Museum Shop. Please allow 5 business days for delivery of tickets. Ticket Delivery Fee is $5.00. Alternatively, you may avoid the Ticket Delivery Fee by choosing to pick up your tickets at the Explore-a-saurus exhibition entrance, Level 3, Queensland Museum. Visit Collectors Cafe to redeem your free dinosaur chocolate offer - one per ticket purchased. The cafe also has a range of dino-themed snacks for the little dinos in your family. Meet and explore some amazing Australian Dinosaurs. Use the clues and your powers of investigation to find out 'Who Am I?' Come face to face with fossils as you follow the Dinosaur trail. Discovery Centre, Level 3. Gold doin donation for trail sheet. 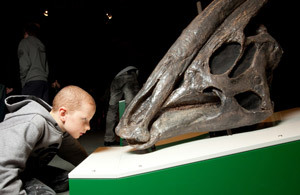 Meet some of the dinosaurs in Explore-a-saurus and discover more about the exhibition. View Learning Resources for teachers and students, including information regarding a Teacher Preview in February 2013.